• Detects combustible gases in LEL and/or volume percentage range, oxygen, carbon monoxide, carbon dioxide, hydrogen sulfide, sulfur dioxide, ammonia, chlorine, VOCs, and many others depending upon sensor configuration. • Rugged over molded polycarbonate housing provides unsurpassed durability, including ability to survive 10-ft. (3m) drop; IP65-certified. • Field-proven integral pump provides consistent gas flow, eliminating concerns of externally-attached components. • Typical life greater than 4 years for combustible, O2, CO/H2S, SO2, CO/NO2 and CO (high concentration) sensors. • Typical life greater than 3 years for NH3 and Cl2 sensors. • Most sensor response and clear times <15 seconds. • MotionAlert feature option tells others that user has become immobile. • InstantAlert feature provides manual alarm to alert others as to a potentially hazardous situation. • PID option allows for accurate, reliable VOC response with programmable reference factors. • Large buttons and bright display provide easy operation, even when users wear gloves. • Exclusive end-of-sensor warning cautions users when unit's sensor nears end-of-life. 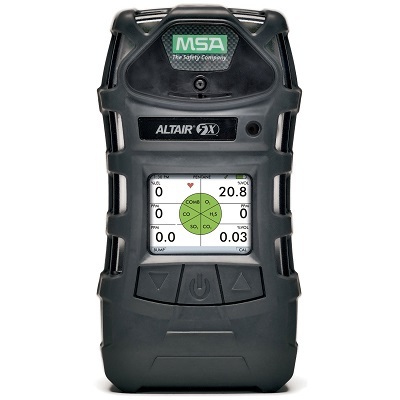 • Versatile MSA Link™ Software allows users to transmit data to a computer.